What do you think of this latest development to our counter? Looking forward to hear your comments..
zhangliang ECRL aside, the anti dumping duty of 16% imposed on Vietnam and china flat roll steel + unlocking of value of Tashin Steel via listing being approved by shareholdersss, surely share can move upwardsss. Let’s see 75 sens first! LGE MINISTER OF FINANCE WILL BE A GOOD PAY MASTER IF HE BUYS GUARDRAILS FROM PRESTAR! TALAM SHALL GO UP AS ECRL DECISION APPROACHES NEARER!! WHOEVER BOUGHT TODAY ON WEAKNESS WILL BE THE HAPPIEST LATER!! Tim2812 Twinkle twinkle Little Star pls transform to super star!! Tim2812 Gambateh I m also on the railways nw!!! Prestar get money fron new ipo but need to pay debt . I dun see any good of prestar . Got debts not a healthy cashflow. Thanks mr calvin . I also agreed prestar now at a cheap price. But mr calvin are you awake your another baby whitehorse now at lowest price. And can ask are you still agreed buy whitehorse? ivan9511 Whitehorse now 1.07 . Why mr calvin not said undervalued . Actually I am feel attractive at 1.07 but I see you stop talking about whitehorse so can ask is that mean you run away from whitehorse or keep sapu quietly ? Tim2812 No volume how to jalan? Tim2812 We r on the boat let's go for the treasure journey. Tim2812 Ivan9511 MR Calvin do lots of research . Don't worries to much is the matter of time will show results soon. ivan9511 Ya . Calvin is always generous to share everything . zhangliang when ur news la? ECRLLL + 16% anti dumping dutyyy. Come on break 70 sens!! Mabel Foreign net selling accelerated in Mar 2019. Foreign investors net sold MYR1.6b worth of Malaysian equities in Mar 2019. We believe that the foreign net sell was due to a combination of poor 4Q18 results season and a more “dovish” Bank Negara Malaysia implying that Malaysian economic growth will ease this year. Cumulative foreign net buy since early-2010 until end-Mar 2019 hit at a multi-year low of MYR1.4b. Apr 2019 likely to be light on news flow. 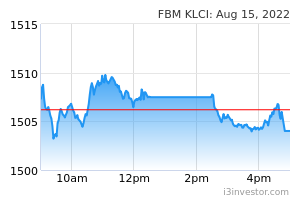 Based on 29 Mar 2019’s market close, KLCI valuations are at 16.0x 12M forward PER (mean: 15.8x) and 1.70x trailing P/B (mean: 1.81x). There will be no BNM Monetary Policy Committee meeting and GDP announcement this month. The sole key domestic lookout this month is the 2nd Belt & Road Summit in Beijing, China from 25-27 Apr 2019 where Malaysia and China are expected to conclude on the East Coast Rail Link. Tim2812 What happen super 3 star nw like 2 starwars? Mabel All ECRL counters it's up an running. Does anyone know why PreStar is still warming up? DAN84 maybe calvin can give us some info about why is it so? slowly got more ppl cover prestar. vcheekeong prestar guard rail jobs for ecrl? ttluck @calvin where are you??? why prestar keep dropping?can advise?